Ariose Notes | New York City – here we come! New York City – here we come! What’s that we see as we look out over Ariose’s stern? Looks like lots of milestones marking our return journey. We’ve made our way back to the northern end of the Bahamas, then accomplished another Gulf Stream crossing, the Intracoastal Waterway was behind us, and now, unbelievably, New York City lay ahead. To get there, though, we faced another off-shore passage but first, there were some things we needed to take care of, so we settled in for a few days’ stay at the complimentary “36-hour only!” Portsmouth municipal dock. What did we need to take care of? It was definitely time to retire our rusted ignition and roasted starter. There’s no way were were going to head out onto the Atlantic without a reliable motor. And just past New York City, we would be taking down our mast so that we could head to Lake Ontario via the canal system with its low bridges. No mast = no sailing. Our motor would no longer be our auxiliary power. We would depend on it alone to take us through the homestretch. The mouth of the Chesapeake has every imaginable boating service you can imagine, so it didn’t take long to find where we could buy a replacement starter. The trouble was, it would have been a long trek to get there, and Tim’s been dealing with a bit of a bum knee lately that would have likely rebelled at any more overuse. The option of taking a cab? Tim himself rebelled at that. Fortunately, fellow cruisers we had met when caught behind the Great Bridge had rented a car, and we gratefully accepted their offer of a lift. At the same time, we also got an unintended lengthy tour of the outskirts of Norfolk. The three of us set out enjoying the novelty of car travel. We had googled the starter place’s location, so had a sense of which way to go, and knew we had to double-check direction at a tricky intersection, but that was miles away. Blame it on the unfamiliar speeds of highway travel – “what? we’re here already!? “- we were unprepared as we hit that critical intersection, and the confusing maze of overpasses funnelled us off to who knows where. That shouldn’t have been a problem, after all, there were three of us, experienced navigators all, with 3 phones, but they were useless. The phones, that is. One had a dead battery, 1 was out of data (and it’s owner unwilling to give Bell any more money for fleeting amounts of data), and the cheap Bahamian phone that was supposed to guide us was unable to pick up any connection. Well, now that I’m writing about it, I realize that the people involved might also qualify for that “useless” label. After covering lots of ground, we finally resorted to old-school navigation methods: stop, ask a local, and write down the directions. Eventually, we found the place, ordered a replacement Yanmar starter and a new ignition, and the shop owner, perhaps taking pity, agreed to deliver the items when they arrived, to us at the waterfront. Mission accomplished! While waited for the parts, and for favourable weather so we could be on our way, we enjoyed checking out Portsmouth, and Norfolk, which was just a quick free ferry ride across the Elizabeth River. … with everything in full bloom. Peaking across the Elizabeth River allowed the overhanging trees to frame Norfolk, and screened out the industrial mayhem just beyond the borders of this shot. The ferry dock was just across from ours – super convenient for catching a lift from Portsmouth to Norfolk. …we’d look up from the cockpit to see something of beauty sail by. Norfolk’s waterfront has recently been refurbished, we’re told, with seedy bars being dislocated by upscale food court-type establishments and parkland. I test drove the comfy seating – thumbs up! One of the best parts of cruising has been the interesting people we meet. Portsmouth & Norfolk were no different. Montrealers Claudie and Laurent, and their sweet toddler Aymeric, were our dock neighbours. 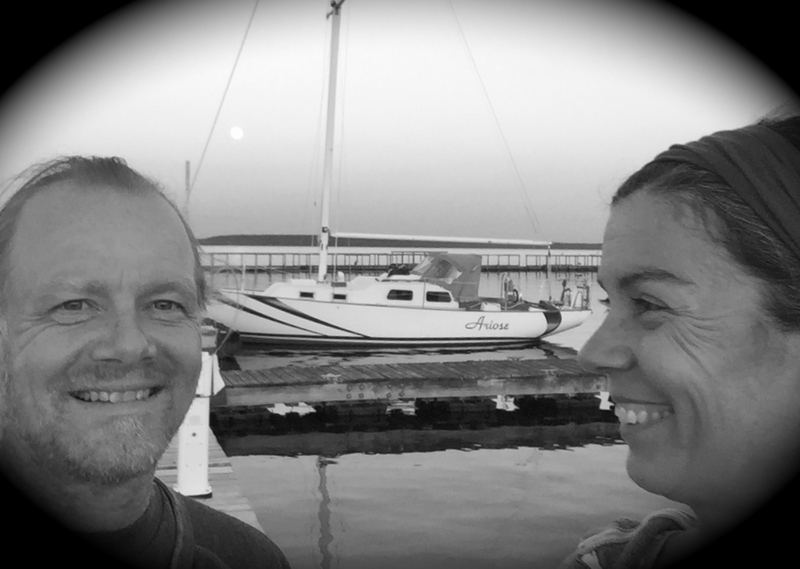 They had been cruising for a year, and were now heading home to expand their family and their funds before setting out for full-time live-aboard life. We also had 5 boats raft up just in front of us at the dock one night, bursting with a couple dozen teenage Sea-Scouts and a handful of adult leaders. They were on an 11 day outing from the Chesapeake to North Carolina. The kids looked like they were having a blast, and it was only day 2, so the adults didn’t look too weary yet. One day, when disembarking the ferry, a backpacker passenger asked where we were from, and as those queries often do, it turned into an engaging dock-side conversation. Walter, recently retired, was an avid hiker, and was training for a 500 mile solo wilderness trek (same distance I walked several years ago on El Camino, but far more challenging). He also had some experience sailing (everyone here in the Chesapeake area seems to have boating in their blood), so we had lots to chat about. That lead to an invitation to his home for a delicious seafood dinner and lovely evening together. When we asked how he had recognized us as not being from the area – maybe we hadn’t fully purged the “ehs” from our vocabulary? Or maybe it was our accent? Or Tim’s ponytail? Or that he saw us getting off Ariose to board the ferry? – Walter refused with a blush, explaining that it was too personal. When pressed, he finally revealed what had given us away. It was my rather inconsequential personal protest against society’s pressure on women to adhere to prescribed beauty standards that signalled we weren’t from “around here”. Hah! Who would have expected unshaven legs to open the door to such hospitality? Within a few days, Tim had the new starter and ignition installed, they were working well, and we had an okay weather window for our next homeward leg: a 3 day, 2 night Atlantic passage. New York City here we come! What do I mean by “okay weather window?” Really, it looked like the winds were going to be on the too-light side, but when facing the Atlantic, we definitely prefer to err in that direction versus the opposite, and we were eager to move on. …later catching up to us as we headed out of the Chesapeake Bay. Did I mention how calm the Atlantic was? …and peaceful as dawn broke. We had a short period of the best kind of excitement – a huge pod of dolphins frolicking. Can you see one leaping? And Tim fought the diesel’s drone to provide us with music. You know it’s a boring passage when for fun we tackle the effects of months of saltwater exposure on Ariose’s stainless. The New Jersey coastline, about 4-5 miles away, as day 2 comes to a close. Sure enough, most of the day, we sailed with trepidation toward ominous clouds , but thankfully, they were moving in the same direction we were, but at a faster pace and we did not get hit. … proceeded to lose an impromptu race to Staten Island to a long distance rower. Made it! Getting Poco off Ariose’s deck and into Great Kills Harbor. We rounded Sandy Hook and with plenty of daylight hours to reach our planned destination on Staten Island, finally turned off the motor and raised our sails. It was nice to end the passage in peace. A fellow remakably rowing from Miami to NYC easily passed us, and seemed to take pleasure in doing so. The passage was uneventful, and memories of our previous passage in these same waters made us ever so thankful of that. That’s the nose of our neighbour in Great Kills Harbour, well anchored it seems. See? You’ll like New Yorkers, Tim. …the Staten Island ferry to Manhattan. There’s hope – New York City is not a fan of Trump. Rocky oasis in Central Park. Dinner out, and a Broadway Show: Beautiful, the Carol King story. Weighing anchor and carefully crossing New York Harbour to find our next anchorage. What a cool one at that!
. .. a gift from France celebrating democracy that quickly became a symbol of hope and freedom. … and we felt especially privileged to not be a part of the hoards. … then many would have departed from the Central RailRoad New Jersey Station, to head off to their new lives. I wonder if the shine of dreams dulled a little as they waited in a separate outside area for their trains … immigrants were not allowed inside the grand station. A vast parkland was just a short row to our west. Where is everyone? The next day, we were politely, but firmly told by police that budget issues had closed the park, and we were trespassing. We were glad that we had spent a few hours exploring it the day before. Manhattan view from New Jersey side of the Hudson River. Powerful memorial commemorating the “innocent” NJ residents “murdered” in 9-11. Very moving, but the impassioned one-sided rhetoric was also disturbing. Some day, perhaps there will be memorials to give voice to the other side of the story, to the many thousands of innocent non-Americans killed by US forces. July 1st came and went, with the only acknowledgement of Canada’s birthday coming from the police officer who ensured we exited that New Jersey park and return promptly to our boat. We have mixed reactions when hearing of the hoopla that went into celebrating Canada’ 150th anniversary. Of course, there’s lots of basis for pride in our country but there’s so much darkness in our history of colonization, this celebration and the resources spent on it, seem to be misplaced. We were fine with being absent. Then July 3rd arrived, and the American 4th of July festivities loomed. Should we stay or go? We considered the prospect of chaos and extreme security on New York City’s waterway, we had had more than our fill of bright lights and people, and we were feeling the pull of getting home, so the decision was easy. We weighed anchor & moved on. In our next Ariose Note, we head north on the scenic Hudson River, transit the New York Canal system including 30 of its locks, and cross Lake Ontario, wrapping up with a tense, but somehow very apt, book-end to our adventure. We’ll leave off with this parting photo, one of our favourite views of Manhattan. Thanks for another well-written and entertaining episode! I am curious about your route from Norfolk to Sandy Hook – was it on the outside or did you head up the Bay to the CD Canal? Hi John – We went with the more direct, outside route. We sailed a couple hours from Norfolk toward the mouth of the Chesapeake, dropped hook in Willoughby Bay near its marina, then headed out the next morning for the 56 hour outside passage. We had Cape May and also Atlantic City identified as our plan B’s should we need a break, but with the calm conditions, it was easy to just keep going. We’d love to explore the Chesapeake, but have put the Delaware Bay – canal – Chesapeake route to our “next time” list. Coming home is weird. We both feel strange; as if everything that we have done in the last 9 months has been a dream. Time has shifted for us. We entertained the thought of turning around, but the reality is, that we have committed ourselves to closing this chapter and beginning another. We look forward to our land and feeling the dirt under our feet. The good news is, we are already dreaming about our next adventure on Ariose! One adventure closes and another one begins! Hi John & Cathy – We’re glad to be home safe & sound too, and are beginning to settle in to our land lives. So nice to have you both along with us on our journey.